I was big into music throughout the 1980's, but honestly I can't remember Canada's Honeymoon Suite from that time. They were bigger than average but hardly set the US charts on fire. The first big hit off their 1984 debut was 'New Girl Now,' reaching #57. Later, in 1986 off 'The Big Prize,' they scored a hit with 'Feel It Again' which rose to #34 on the charts. The band, named after the unofficial honeymoon capital of North America, Niagra Falls, continued to 1991, disbanded, and then returned 10 years later releasing two back to back albums. Absent again, HMS returns in 2008 with 'Clifton Hill' (another nod to the neighborhood), a generally solid album of melodic rock that, at times, veres towards album-oriented rock. If this being true, then what we have on 'Clifton Hill' is simply some solid melodic rock. Musically the compositions are varied from straight rockers like 'She Ain't Alright' and 'That Is All U Got' to the milder, more ballad-like tunes like 'Ordinary' and 'Why Should I.' The lyrical content shows depth and intelligence. The musicianship is proficient and accurate especially in the vocal presentation and guitar solos. So, generally, I enjoyed 'Clifton Hill.' I didn't blow my doors off, but in the music I hear the enthusiasm that some had for HMS back in the day. 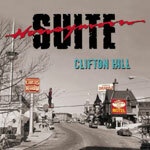 If you were a fan in the past, I think you're going to love Honeymoon Suite's 'Clifton Hill.' If this was their form in the earlier years, then it's a fine return to form: a solid work of melodic rock. Recommended. If you were a fan in the past, I think you're going to love Honeymoon Suite's 'Clifton Hill.' If this was their form in the earlier years, then it's a fine return to form: a solid work of melodic rock.